I was not the kind of person who would change or go for different nail colors as the season changes. Even now I love to use nail colors according to the moods and occasions but once in a while I do not mind following the trends. Fall has arrived and the dark, bright and bold colors are in. 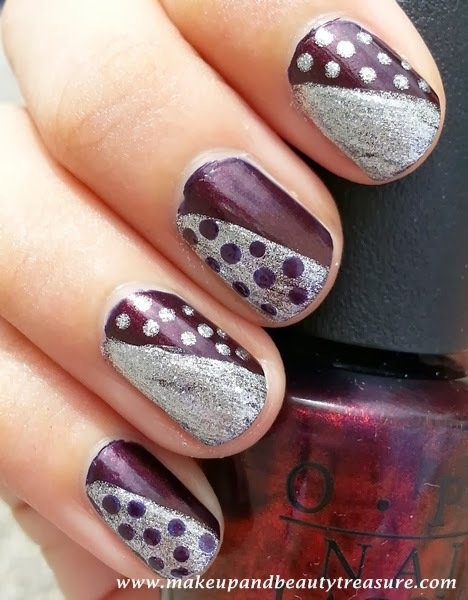 I tried a simple nail art that I thought is great for this season. 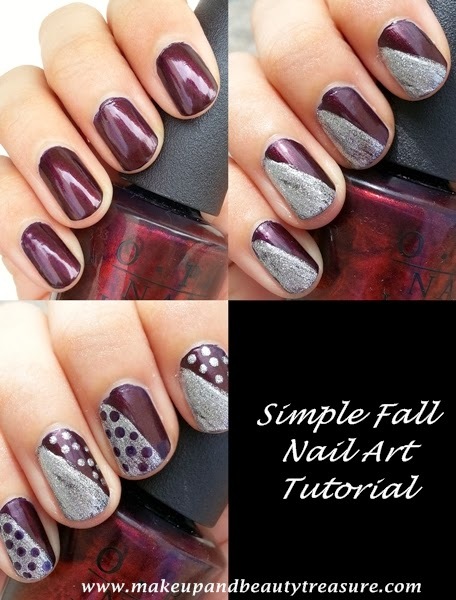 Today I am going to show you the tutorial of a simple nail art that you can do for this awesome season. • Apply a base coat. Let it dry completely. 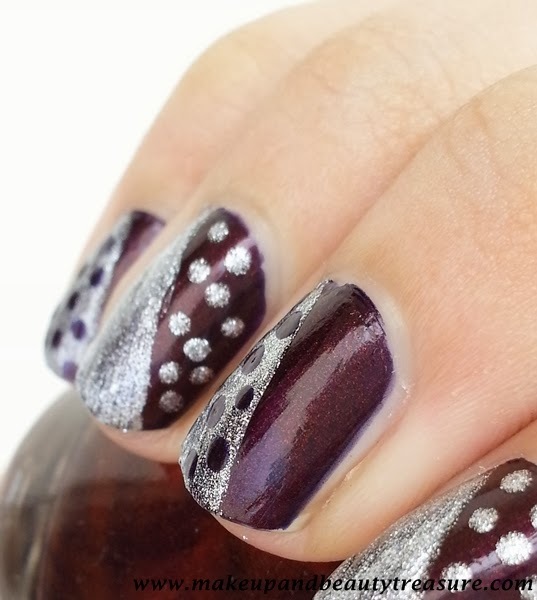 • Apply a dark base coat of your choice (I used OPI Nail Lacquer in Every Month is Oktoberfest’). Let it dry completely. • Apply silver nail color diagonally. Let it dry completely. 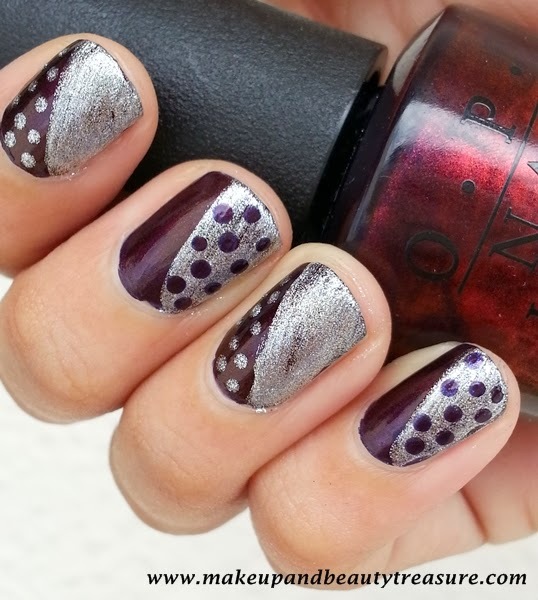 • Using a medium sized dotting tool, apply dots of base color on silver color alternatively on each nail and vice versa. Let it dry completely. • Apply a top coat to make the nail art last longer and yay our nail art is ready. • OPI Nail Lacquer in ‘Every Month is Oktoberfest’. Read review here. • Street Wear Color Rich Nail Enamel in ‘Silver Sparkles’. 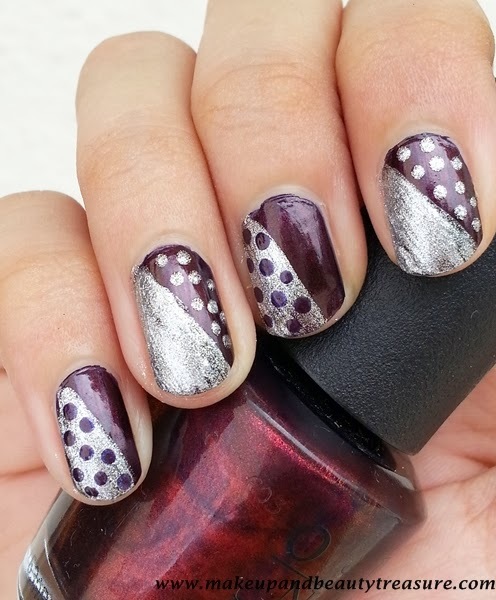 The nail art is super easy to do and can be created by everyone. It does not need any nail art expertise skills. 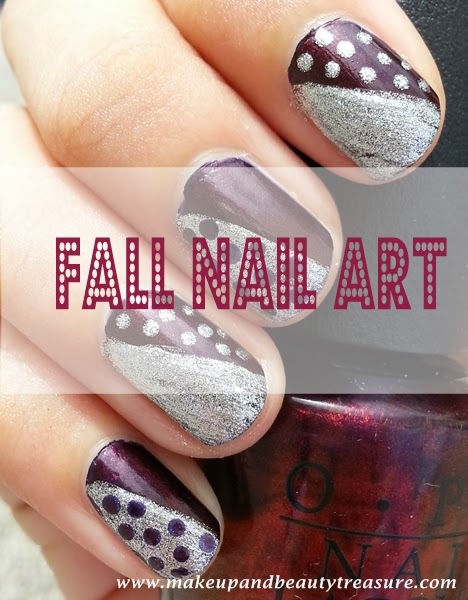 The design looks elegant and classy on nails and is great for fall and winter season. It does not consume much time and looks great on both short and long nails. lovely nail art Megha :) I love Every month is oktoberfest, such a perfect shade for fall! Thank you so much Rads! Woooww. the OPI nail paint looks so royall.. and I must what a lovely nail art..!! lovely pictures meghs!!!!! i love that base color alot! Loved it so much...very very pretty pretty! So snow white, you know nail art also that means multi talented. Your nails are loking simple and fun and absolutely stunning. I loved the nail art - Pretty !